Chaos after the big de-coiling wave.. There are no more uni-directional flowing of this sea ice area centered about 81.3 N 170.8 E.
Sea ice is moving SSE in the right upper corner, towards SE at center and Westwards on the top left hand corner. There is a whole lot of open water. Thin clouds mask the true nature of sea ice hidden most times. But the easy sea ice deformation processes is obvious, of apparently a glue of very thin sea ice, slush or floating snow between surviving older sea ice pans. Surface temperatures were mild on the 30th, about -6 C, at this temp sea ice doesn't form easily if sea water is warmer than -1.8 C. However, if the nature of top surface sea water is not so salty, it can freeze, but not accrete rapidly enough to slow the ice movement, as apparent here. 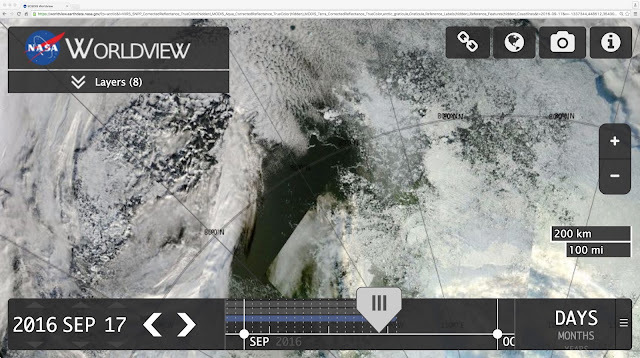 Deformations as seen above, wouldn't happen so quickly if any of the new sea ice was thick. 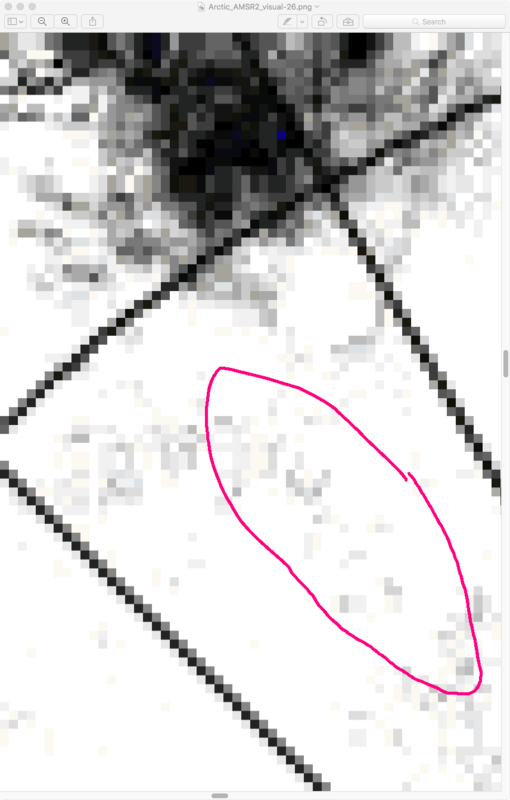 JAXA extent replication of the same area, pixels do not mimic the open water areas. CMC september 27 00z, a very modest Low pressure system is responsible. Temperatures about this area are -5 to -6 C.
Raining during an Arctic heat wave, when snow use to reign. 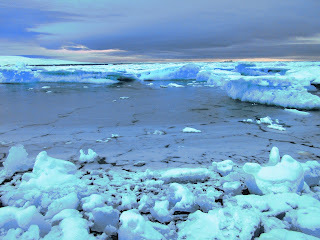 The true colour of sea ice is revealed once snow cover melted. The larger pans here are about 2 meters thick, Arctic Ocean survivors of the summers melt. A melt pond water temperature was +0.3 C. Beach ridge top small pebble layer temperature was +2 C, near where there was water same layer was below zero C.
Dense pack keeps on dispersing with leads widening in very warm temperatures. Displacement of densest pack ice (83.5 N 111 W) has accelerated! From 3 to 4.4 nautical miles Northwards a day. Expansion between the leads has almost increased universally as well. Long going, de-coiling momentum synergistically combined with the winds on top of warming temperatures and ever so present non amenable to freezing sea water. It would be a mistake to infer that extent has increased because of greater coverage of sea ice. Surface temperatures are -1 to -2 C, again this event calls for better analysis tools. 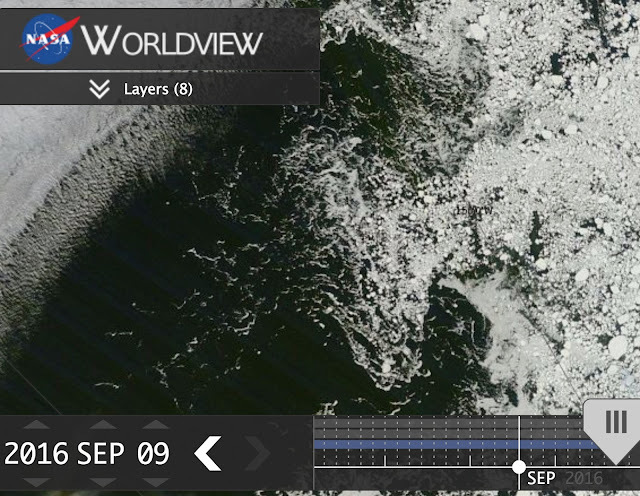 The correct interpretation is that there is more open water per grid, thus less sea ice. Listen at melting sea ice so late in September with temperature 8 degrees above the daily maximum average. At 67 meters above sea level official temperature was +2 C, at sea level a little higher. 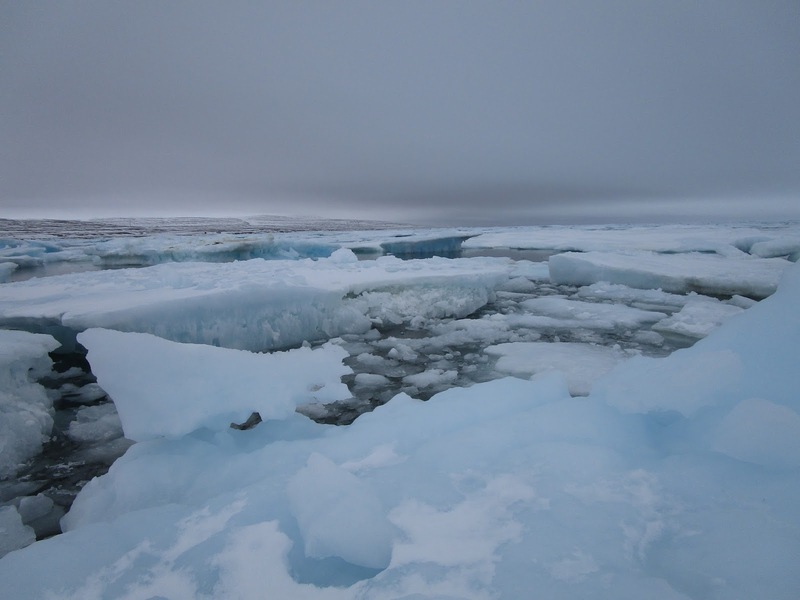 Sea water temp was -0.5 C despite teh Bay being full with colder Multiyear sea ice. Black rock shore ridge inside temperature was +.6 C.
2016 is a dispersed melt season with significant differences with a more compact 2012 within densest remaining pack ice. 2016 smack where the densest ice should be has had a lot of open water. 2012 same location slightly to the North of above (because of clouds), de-coiled sea ice with less open water. 2012-2016 83.5 N 155 W again more open water for 2016. How exactly do we judge melt seasons when one is dispersed and the other one is compacted? 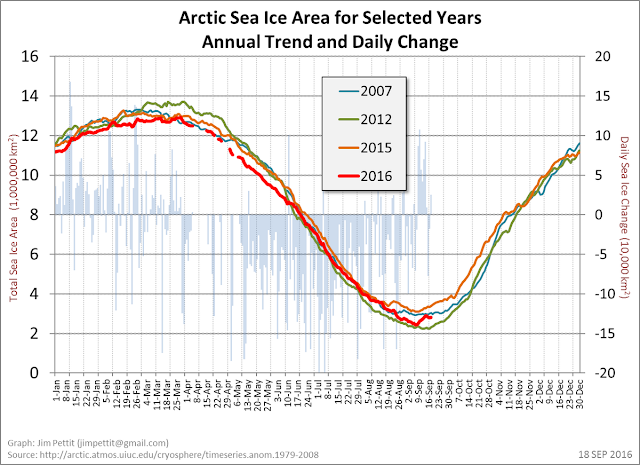 If we look at this sea ice area graph, the minima of 2016 is nearly equal to 2012. That is much more accurate than extent metrics. The significance of all this, compact years use to be the norm, since 2012, dispersed sea ice at minima has become prominent. Therefore 2016 minimum sea ice is very close to 2012, either way, just below or just above, this is important to conceptualize, a simple concentration figure would lay away a lot of confusion though.WDSeptember 23,2016. Snow or Grey ice or a mix of both? + Rapid displacements at minima. I calculate 30.6 nautical miles displacement in 5 days, note ^^^^^^^^^^^^^^^^ big pan on September 16 just above (86.57N 109.29E). It travelled on average more than 6 nautical miles a day, very rapid rate AGAINST the Transpolar Stream Current. It means that there is a lot of grey ice and floating snow between the broken packs . If grey areas was new sea ice they would completely cover the gaps, But if it is floating snow or grey ice the leeward side would be full while the windward (towards the bottom of this page) open, the open water locations change so it is likely floating snow which changes in texture with time and exposure. Sea ice would set easier on the windward because pack ice offers no waves and a wind shade facilitating freeze-up more. 83 N 112W smack in the middle of densest but de-coiled pack ice, with temperatures between -10 to -17 C , still has open water (by movement) with a daily displacement of 3 nautical miles a day, a very rapid rate for dense pack indeed. But with new sea ice, recognized by drifting snow on top of it. A day has past and some ice multi-year ice has moved away along with much less floating/submerged snow. Company, 2 Polar bears and partner in crime fox were just here. Yesterday's bergy bit is no longer surrounded by floating snow. JAXA depictions September 15-17-18 top to bottom. Wild daily variations. Vast expansion of scattered sea ice does not seem to record open water extent gains numerically, or it likely snowed a whole lot. ~Snow showers can confuse data to look like sea ice but there are some differences. Invasion of what is left of the Multiyear ice shows striking image, the top sea ice is smooth the bottom ravaged by -1 C water. 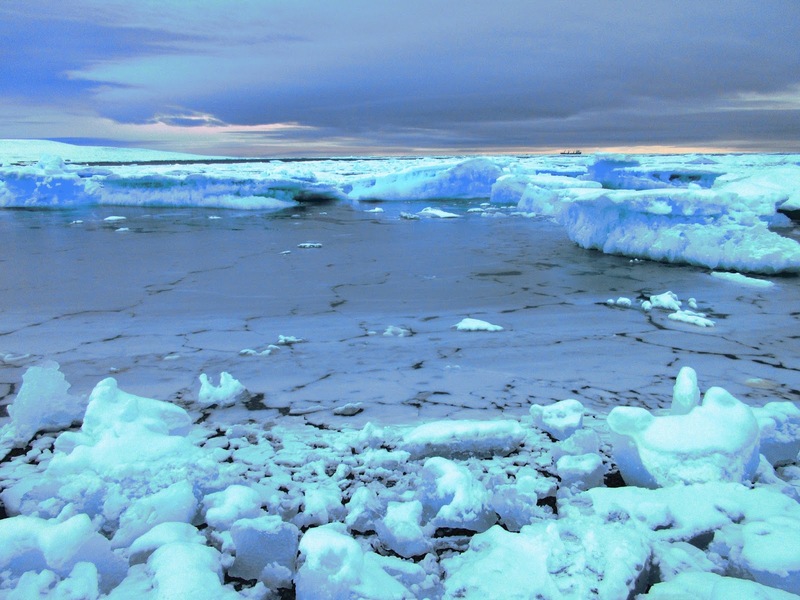 Top sea ice layer has less salt and would be the last to go. But this bergybit is surrounded by what appears to be smooth sea ice, look carefully, it is submerged fresh snow for the most part some segments have the snow sticking above water level. Fresh snow on lower tide sea shore gradually submerging in deeper water. 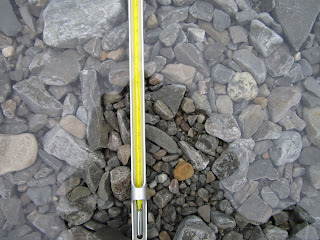 Submerged snow differs from grey ice in colour and texture, it mostly appears smooth. The melting continues, despite minima almost declared formally, there is a lot of moist air about the entire Arctic, clouds are very thick layered with rain turning to snow near ground in some parts. There are at least 3 important Cyclones vicinity or over sea ice, one is almost quasi-stationary North of Beaufort, laying steady between water and sea ice. This does not come as a surprise, the JAXA depiction here of sea is a lot less solid pack than the replication suggests, there are plenty of warm spot sources keeping the cyclones steady. Cooling is mainly happening over the Canadian Arctic Archipelago, not a surprise as well, it was foreseen here long ago, but there is a lot of snow falling from cyclonic activity compounding a warm cold heat engine complex. 2012 was the minima year of record under the 15% peripheral method of measuring sea ice extent or area. But as shown here just South of the Pole and North of Greenland, had far denser sea ice, less mobile, as it should have been, than 2016. 2015 same date showed the leads and fissures about to be bigger the following year. 2016 has utterly chaotic loose fluid sea ice where it was at 2012 minima relatively immobile and solid. 2016 to date has sea ice moving towards the Pole quite rapidly, incredible if you think of it. The larger question is again raised, how is 2012 the said minima year when 2016 has far less denser ice pack where it was most solid for Centuries? Should we use a far more accurate and less esoteric method of judging sea ice quality and quantity? Same area had similar smudges, but as we have seen on pictures above, much more water. Very un-coiled state of sea ice on the Canadian Greenlandic side of the Pole continues, with open leads amongst many fractures easily susceptible to weather, on the 13th frame we see approaching Low which should change this configuration shortly. JAXA September 13 2016. The 15% rule masks or covers up this state of affairs with apparent sea ice not present. The illusory diminution of open water is very much greater with loose pack ice presently on the Pole to Russian sector. It is an acceptable depiction, as long as one is aware of the way these maps are made, but why not replicate reality as fully as possible and forego this 15% rule at least with different full reality charts? The luxury of no clouds for good observations is at times rare and fleeting. The Canadian side of the Pole is literally breaking apart. JAXA chart keeps on showing expansion of sea ice, which is exactly following the 15% rule. Looking carefully, even with colder sea water and air near the Pole, there is a presence of Goodbye Waves. But far skinnier than near Franz Josef Lands. ~National Geographic excellent presentation about likely reason for R.M.S. Titanic collision with Iceberg has only one problem: Its not possible. ~ Water walls are the rarest refraction effect ever, never seen in the land of refractions. 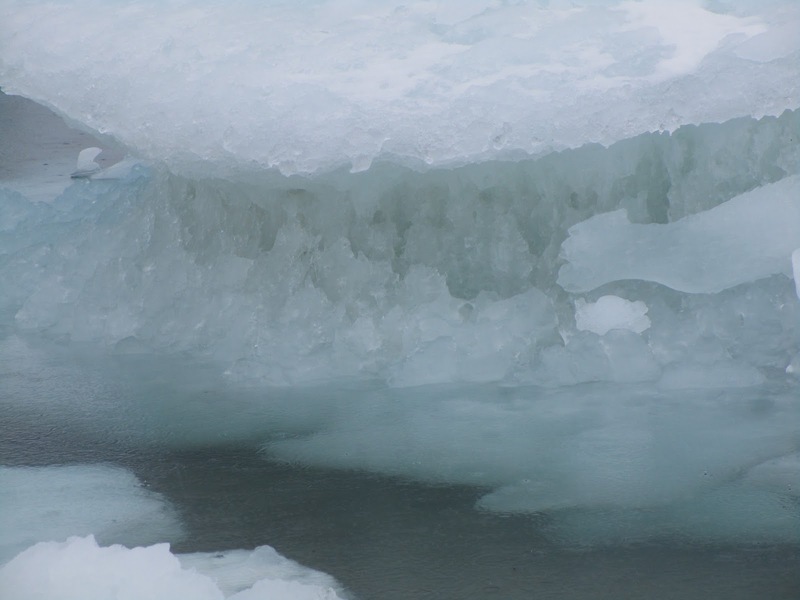 The thickest densest sea ice left in the Arctic is unravelling at its faults lines. 18z CMC Sep 9 2016 surface chart has no significant meteorological reason for this. Wrangel bridge waves away: Goodbye!